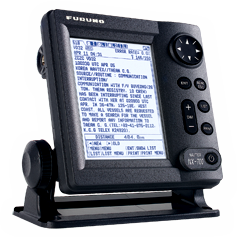 FURUNO NX700 is a dual-channel NAVTEX receiver for SOLAS ships complying with the new NAVTEX performance standard MSC.148(77) which is implemented on and after 1 July 2005. The NX700 can receives two channels simultaneously. One is set for 518 kHz to receive international NAVTEX messages and another is selectable from 490 or 4209.5 kHz for domestic or local NAVTEX messages. These messages include a variety of safety information such as Navigational Warnings, Meteorological Warnings, Search and Rescue (SAR) information and other information for ships sailing within the reach of each service station’s coverage. The broadcast station can be selected automatically according to own ship position when the NX700 is connected with a GPS navigator. Every incoming message is stored in non-volatile memory and is displayed on a clear 5" silver bright LCD. Three different font sizes are available and can be selected from the menu. The NX700 has a low profile, stylish display, receiver and antenna unit. An external Serial (RS-232) printer can easily be connected for message printing. The compact, umbrella-type H-field antenna requires no grounding. In addition, the antenna incorporates a high-performance preamp within the compact body, which gives reliable and uninterrupted reception without an extra whip antenna.